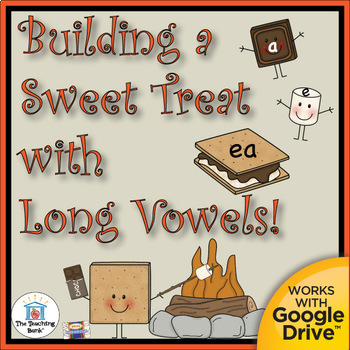 Building Sweet a Treat with Long Vowels! 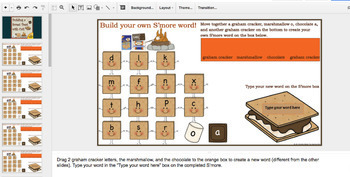 , which works for both print and Google Drive™, is a bundled set of Common Core Standard aligned manipulative activities to help reinforce the long vowel a, e, o, and u sounds made with the ai, ea, ee, oa, and oo families. You can use these activities in a learning center or you can create file folder games. The Google Drive option allows you to share a prep-free paperless interactive version for your students to complete. 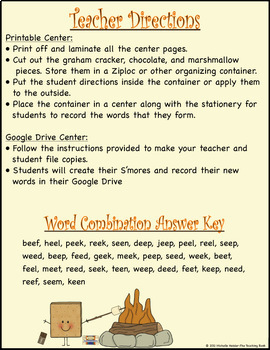 • Guide with a link to Google Drive file and instructions on how to use. • 36 graham cracker letters, 18 marshmallow o's, and 18 chocolate a's. • Themed stationery for the student that coordinates with the activity. • Common Core Standards Checklist for grades K-2. 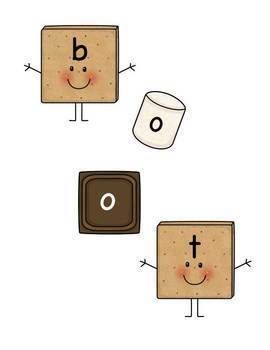 • 50 graham cracker letters, 25 marshmallow a's, and 25 chocolate i's. • 64 graham cracker letters, 32 marshmallow e's, and 32 chocolate a's. • 64 graham cracker letters, 32 marshmallow e's, and 32 chocolate e's. • 56 graham cracker letters, 28 marshmallow o's, and 28 chocolate o's. ★This zip file contains the 5 individual PDF files for each center. →Please see the previews for each center by clicking the individual center links above.